Top place in the initial stage group without ever being in serious danger; the leading names on duty at the Buenos Aires 2018 Youth Olympic Games Asian Continental Qualification Tournament in the Indian city of Greater Noidas, all made ideal starts to their second stage group contests on Saturday 4th November. Four groups in the second phase in each of the Men’s Singles and Women’s Singles event, the players finishing in first places in each group gain invitations for the Buenos Aires 2018 Youth Olympic Games, the second placed players compete for the reserve positions. Japan’s Tomokazu Harimoto, the top seed, set the standard in the second stage of the Men’s Singles event. He beat Singapore’s Pang Yew En Koen in five games (11-7, 12-14, 11-7, 11-9, 11-3). 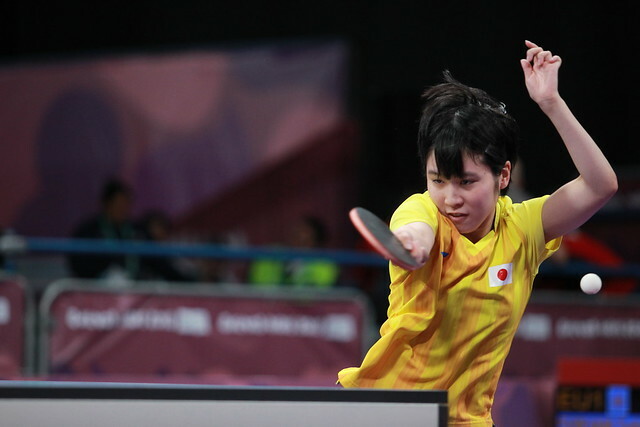 Likewise Chinese Taipei’s Lin Yun-Ju, China’s Wang Chuqin and Korea’s Cho Daeseong were relatively untroubled in their opening second stage encounters. None required a seventh game in order to gain the decision; life was drama free. Lin Yun-Ju was the member of the group to experience the greatest problem; he withstood a spirited recovery by Hong Kong’s Maurice Chang Kai Ning (11-7, 11-3, 11-4, 9-11, 9-11, 11-5), Wang Chuqin accounted for Jordan’s Khaled Kader (11-2, 11-9, 11-3, 11-3); Cho Daeseong overcame Kazakhstan’s Aidos Kenzhigulov (11-9, 11-8, 11-4, 11-6). Similarly, as proceedings commenced in the second stage of the Women’s Singles event, it was the same scenario with Japan setting the example. Miu Hirano beat Korea’s Lee Daeun (11-8, 11-3, 11-8, 11-6); in a similar vein China’s Sun Yingsha accounted for Uzbekistan’s Kamila Khalikova (11-4, 11-5, 11-4, 11-3). Meanwhile, not be upstaged, Thailand’s Jinnipa Sawettabut enjoyed success against Singapore’s Zhang Wanling (11-9, 11-3, 11-6, 11-3) as did Chinese Taipei’s Su Pei-Ling when opposing Iran’s Mahshid Ashtari (11-7, 11-5, 11-4, 3-11, 11-2). One match remains for each of the leading names; play concludes on Sunday 5th November.